45% of Americans use their Facebook News feeds to get news, the highest portion for any social network. As the Facebook News Feed plays such an important role in how we find our news, it is alarming that the platform often plays host to heavily biased or even false stories. Therefore, in order to gain a complete and accurate picture of the news from Facebook, it is important to understand how the News Feed works and how it can be effectively tailored to deliver quality journalism. Your Facebook News Feed is, at its core, a collection of posts from the people you’re friends with and the pages that you “Like.” Because of this, it’s easy to build up a News Feed that consists mostly of articles that your friends are sharing and that a few of your favorite brands are sharing, which can lead to a collection of posts all sharing the same point of view. This can reinforce confirmation bias and limit the lens through which you see important stories. In order to branch out and build a complete News Feed, consider “Liking” the Facebook pages of several mainstream news outlets so that your News Feed will include important stories from multiple sources. Facebook Groups are a great way to interact with others who share the same interests as you but may hold different beliefs. Additionally, posts in Groups that you are a member of will appear on your News Feed, adding yet another level of depth to the content that you see every time you scroll through. Find Groups that focus on news surrounding whatever topics you’re interested in and Groups created by organizations that you want to engage with on a deeper level. You will open your News Feed to discussion and debate about articles that you read, therefore seeing new points of view on every topic. To further broaden your horizons, choose Groups that seem to have a lively exchange of ideas, rather than those that are merely echo chambers repeating the same point of view over and over. Sponsored Posts are posts that the publisher pays Facebook (by the view or by the click) to place in the News Feeds of people who its algorithms think will be most receptive to the posts. Some sponsored posts are clearly advertisements to sell products, but many news outlets will sponsor their content to boost traffic to their websites. Sponsored content blends into the News Feed well, but it can be identified by the word “Sponsored” placed under the Publisher’s name. Sponsored posts will often seem quite relevant to you, as Facebook is very clever in using what it knows about you to target advertising, but just remember that they are advertisements. 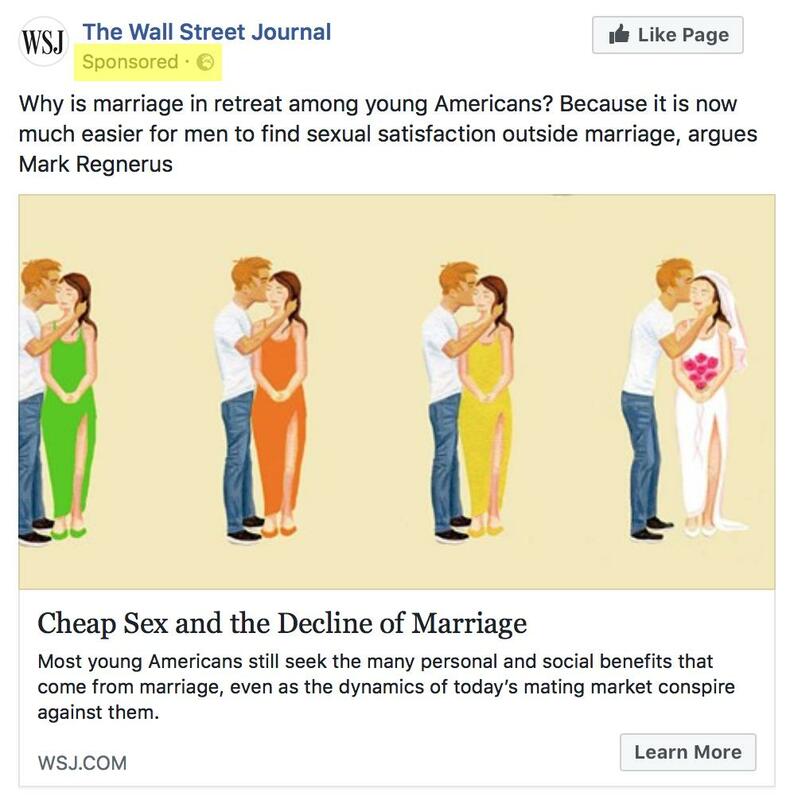 Just because an article is sponsored does not mean it is necessarily untrustworthy, as, for example, The Wall Street Journal is a well-established news outlet. However, when you see the word “Sponsored,” pay extra attention to who is posting the article, and ask yourself: why is this company paying to make sure I see this article? Because Facebook assumes relevance of content and organizes the News Feed based partly on the number of engagements (Reactions, Comments, Shares), publishers will often create their posts in ways that are designed to force engagement or otherwise trick the system into giving them a higher relevance score. Examples of tactics to boost relevance score include posts that contain calls to action, including, “Heart react if…,” “Tag a friend who…,” or “Share this if you agree.” Other features of Engagement bait posts include a still image that is formatted as a video, an image that is just plain text, or other strange formatting quirks – all tactics designed to make the News Feed algorithm think a post is more “interactive” than it actually is and boost its place on the News Feed. As engagement bait is often used by publishers looking to get their engagement numbers higher, and is sometimes a quick alternative for substantive content, be wary of any posts that are using this tactic. The most important thing to remember is that your News Feed is not a news source itself, but rather a collection of articles and posts that Facebook thinks will be important to you as you go about your day. If you see a post, article, or video that excites you, angers you, or otherwise interests you, don’t just take it for what it has to say and call it a day. Read the article, find out exactly who wrote it and see what else they’ve written. Run a quick Google Search on the topic or story to see what else you can find and expand your knowledge on the subject. The Facebook News Feed is a powerful tool to point you to interesting stories in the vast quantity of information that is the internet, but it is by no means a one-stop shop.